ATHENS — Former Covington standout A.J. Oullette continued an impressive close to his senior season at Ohio University, recording his third-straight 100-yard rushing game and celebrated Senior Day Friday as the Bobcats handled Akron 49-28 to finished 8-4 overall and 6-2 in the MAC. OU mat still play in a bowl game to be announced later. Ouellette took a direct snap and ran into the end zone from six yards out to give the Bobcats the early 7-0 lead. With OU leading 21-7 late in the first half, Ouellette rushed for 51 yards on four touches, with the last carry going for 16 yards and a touchdown to give OU a 28-7 with five minutes to go in the first half. After Akron got within 28-14 in the third quarter, Ouellette put Ohio on his back on the ensuing drive, ripping off runs of 25 yards and 44 yards to give Ohio a 1st-and-goal at the six, which led to another Bobcat touchdown. He tallied his 13th career 100-yard game, which ranks as the fifth-most in program history. Ouellette eclipsed the 1,000-yard rushing mark for the second year in a row, giving him the distinction of being the fourth player in program history to run for at least 1,000 yards in multiple seasons. Oullette moved into third place on Ohio’s all-time rushing list with 3,620 career rushing yards. His 12 rushing touchdowns this season are a career high and tie him for the eighth-most in a single season in program history, while his 32 career rushing touchdowns rank as the fourth-most in program history. The Bobcats finished the season 6-0 at home. Ouellette talked about being a walk-on as a freshman. Earlier this week Ouellette was named the Mid-American Conference East Division Week 12 Offensive Player of the Week, as announced by the league office today. Ouellette earned weekly conference honors for the second time in 2018. He was also named MAC East Division Offensive Player of the Week in week nine. 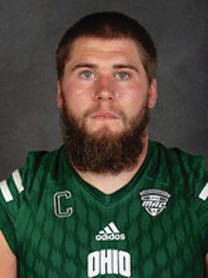 He is one of two student-athletes who have accounted for five MAC East Division Offensive Player of the Week honors for Ohio this season, with junior quarterback Nathan Rourke (Oakville, Ontario, Canada) earning honors in weeks five, six and eight. Ouellette rumbled for a career-high 196 yards and two touchdowns on 26 carries and also caught a touchdown to help lead Ohio to a 52-17 win over MAC East Division rival Buffalo Nov. 14 at Peden Stadium in Athens. Ouellette rushed for an eight-yard touchdown in the second quarter, caught an eight-yard touchdown pass from Rourke in the third and capped off the scoring for the Bobcats with a 33-yard touchdown run in the fourth.